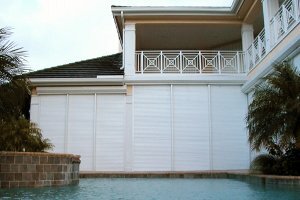 Roll-up Shutters | Willard Shutter Company Inc.
Willard Rolling Shutters, also known as roll-up shutters or over-head coiling shutters, consist of a self-mating horizontal slat systems that open and close by operation of an over-head axle tube suspended in a shutter housing or over-head cavity. 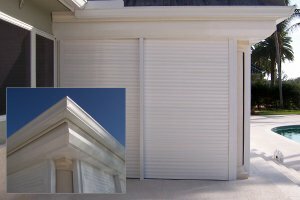 These shutters are available in a variety of configurations to suit various applications. 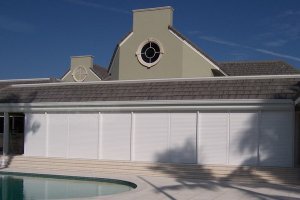 They can be effectively used for hurricane & storm protection, security, privacy, sunshade, and insulation. Also offered is a variety of electronic controls and accessories such as remote controls, security keypads, timers, weather & light sensors, low voltage dry contacts, and other intelligent, smart house controls allowing customization in order to satisfy today’s modern architectural smart system designs. When selecting a rolling shutter product for your application, slat engineering, is very important in determining the right combination of function, performance and budget. 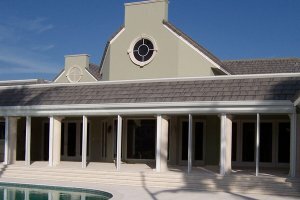 At Willard, we offer several proven slat systems ranging from simple shade & privacy to severe storm & hurricane protections. Slat, track, and axle components are manufactured from 100% heavy-duty aluminum extrusions, and assembled with non-ferrous fasteners. Each slat system is assembled using polyethylene side-locks or end retainers, and matched with a specific, engineered guide rail to achieve best possible slat performance. Equally, important to the over-all function and life expectancy of a rolling shutter is the parts inside. At Willard, we manufacture our shutters using premium, brand name, operators and components, and pre-test them in house prior to shipping. Our commitment to precision component matching, and our extensive design and installation experience guarantees our clients a premium quality product that is built to last.